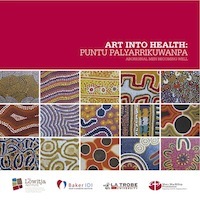 This beautiful full-colour booklet describes a unique collection of 15 paintings through which Aboriginal men from the Western Desert offer their perspectives on their lives and wellbeing through art. Using contemporary techniques and methods, the artists present a wide range of narratives that link ancient ways of understanding and describing their world today. The collection, therefore, provides an important and valuable body of knowledge about Aboriginal health.